Out of this continuing divestment trend we are seeing more Asian private banks, with an increasing international focus, joining the top ranks of Global Private Wealth Managers. 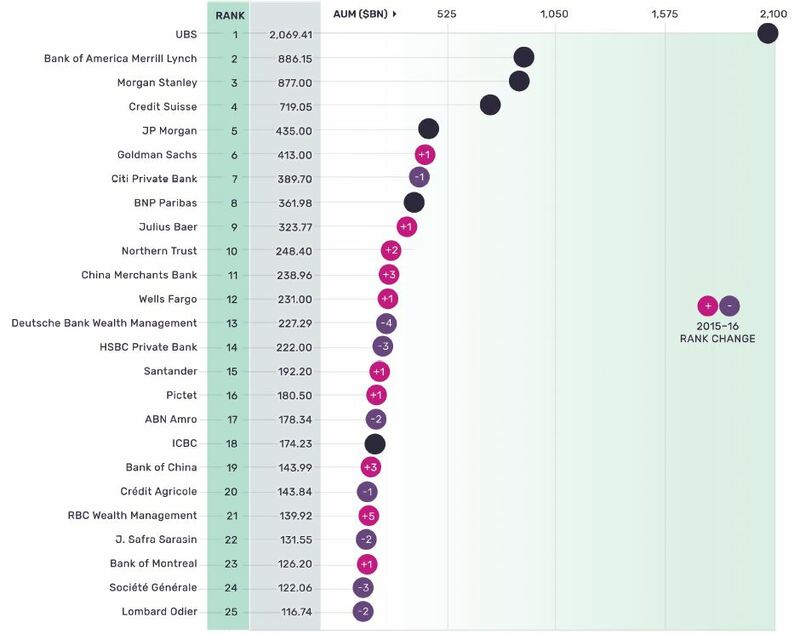 – Information based on 2016 Global Private Wealth Managers AUM Ranking from GlobalData and Private Banker International. – The ranking captures the AUM of private banking and wealth management operations of the world’s leading competitors. The data was collected from competitors’ publicly available materials (such as annual reports and financial statements), or from contacts in relevant organizations. – The definition of AUM differs between wealth managers. To ensure figures are comparable, the data underwent our standardization process, with the aim of capturing assets held with a provider for investment purposes by private clients, under the beneficial ownership of the client. Presented figures exclude assets held only in custody, as well as pure asset management operations. Where no detailed breakdown of AUM was provided by a competitor, we used our model to estimate the most accurate numbers.